As just about everyone now knows, the first Hangover movie became one of 2009’s monster hits, a surprise attack of blatantly crude humor that boosted two careers, those belonging to Bradley Cooper and Zach Galifianakis. Cooper, of course, went on to earn an Academy Award nomination for his work in Silver Linings Playbook, and Galifianakis has become an indispensable addition to a long line of taste-defying comics who’ll step across almost any line. The series’ third — and apparently final installment — probably won’t hurt either actor, even though in The Hangover Part III a half-serious (and none too exciting) thriller plot hijacks most of the laughs. The movie’s first joke (already spoiled by its trailer) involves the decapitation of a giraffe. This bit of animal carnage arrives courtesy of Alan, the proudly stupid character played by Galifianakis. Obviously, the filmmakers did not behead a real animal, but the off-putting joke (one of many) was enough to make me consider becoming a card-carrying PETA member. The familiar crew (Cooper, Ed Helms and Justin Bartha) returns under the guidance of director Todd Phillips, whose slick approach seems at odds with the ragged spirit of the best Hangover jokes. Putting this kind of production value into a Hangover movie seems as misguided as hiring James Levine to conduct an all-kazoo orchestra — not that Phillips qualifies as a maestro of movies. This episode adds a couple of new wrinkles. John Goodman portrays a gangster who’s upset about the fact that the sexually dubious Chow (an over-exposed Ken Jeong) has stolen millions in gold from him. Melissa McCarthy appears as the operator of a Las Vegas pawn shop where Chow unloads the purloined gold. A scene in which McCarthy confronts her cinematic soul mate (Galifianakis) teeters on the edge of being funny without quite tumbling into the expected hilarity. The story eventually sends our heroes back to Las Vegas, perhaps in hopes of recapturing some of the brazenness of the hard-partying first movie. The strategy produces an insufficient number of laughs while Phillips plays around with thriller tropes and the actors await their obligatory doses of humiliation. Oddly, there’s hardly any drinking in this installment, and the only real hangover stems from whatever residual affection audiences can muster for characters whose unashamed pursuit of pleasure has led them into many drastically compromising situations. Put another way, Hangover Part 3 runs on whatever comic vapors linger from the first installment. 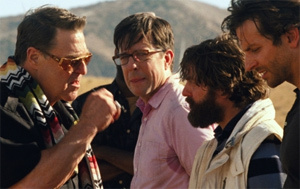 I’ve never been a big fan of the Hangover movies, but I certainly understood the appeal of the first movie, which pushed the envelope of grossness to what approached genre-breaking limits. I was unimpressed by the overproduced waste of the second and entirely dismayed by a third edition that stops in Tijuana before heading to Vegas. A sequence following the end credits pays homage to the outrageous spirit of the movie’s 2009 predecessor — but it’s a classic case of arriving too late to make much difference. Hard-core Hangover fans who stick around for this epilogue — which boasts the movie’s wildest sight gag — may think that this is precisely where Hangover Part III should have started.